Get ready for some M&M Summer fun! Join us for our "Mix and Mingle" Event at our 'Meeting @ Microsoft". Relax and hear our guest speaker Sarita Maybin, author of "If You Can't Say Something Nice, What DO You Say?" share some pearls of wisdom on "Communicating for Success". In this interactive session, you will learn how to communicate in a way that gets your ideas heard and encourages the cooperation of others. Sarita will share her Top Ten Positive Communication Phrases and her Two "Green Jello" Principles of Conflict Resolution. Next... put your running shoes on as we are also not just going to Network. We are going to do it in style with "Speed Mingling". Bring plenty of business cards! 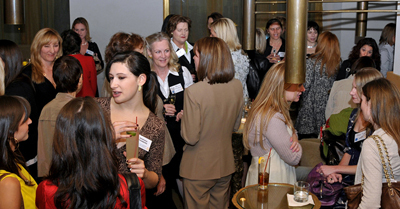 Enjoy light hors d'oeuvres and get ready to "Mix and Mingle" with fellow WITI members and women in technology! Sarita Maybin is an international speaker and communication expert whose audiences have fun learning how to stay positive, constructively confront tough communication situations and work together better. Sarita's clients include Hewlett Packard, Kaiser Permanente, Los Angeles County Department of Navy and the Las Vegas Convention Center among others. Since 1993, Sarita has spoken at conferences, companies and campuses in 49 states, Puerto Rico, Mexico, Jamaica, Canada, England, Asia, and Iceland. She was also voted a 2012 Top 5 Communication Speaker. Sarita is a former univeristy Dean of Students with a Masters degree in Counseling, a Toastmasters Humorous Speech Contest winner and a Past President of the National Speakers Association, San Diego chapter. She has been interviewed by the media about her book entitled "If You Can't Say Something Nice, What DO You Say?"